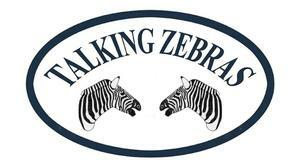 ​​Talking Zebras was founded in 2012 to promote enjoyment of the spoken word. At our core, we have our friendly meetings, lasting about 2½ hours, held 2-3 times a month on a Saturday afternoon. We also enjoy taking part in local Literature, Folk and Arts Festivals. We're a diverse group who enjoy a wide range of spoken word, and we rarely hear fewer than 50 pieces being read/performed in a typical session. We also offer our members and visitors the opportunity to do a 15-minute "spot light" spot - these are pre-arranged, so please contact us in advance if you're interested in performing. ​We meet on the 1st, 3rd and 5th Saturdays of each month in the comfortable surroundings of the Wickham Arms in Cleckheaton. We are always on the lookout for new opportunities to perform, for sponsors for our poetry competitions, and of course for new members (speakers and listeners alike) - so why not get in touch? - you can email us at talking_zebras@yahoo.co.uk, or just come along and join us at a meeting - we don't bite!